Hello people! Hope you are doing well. I’m back with yet another spoiler post regarding Attack on Titan season 3 episode 5. Also, this post is full of spoilers so whoever does not like to read spoilers please stay away from this post. So, without further delay let us begin. So, let me give you all a brief summary of what happened in the last episode. In the last episode, we saw Levi Squad getting a hold of Hitch and Marlo. Levi Squad persuades them to help them so that they are able to get past the police checkpoint. Also, cover of the interior squad was revealed by Hange and Flegel. Which was a bit satisfying to see. Later we also saw that Erwin was being tortured and interrogated but didn’t give up any sort of information regarding Scout Regiment. Gerald is left amused at this. 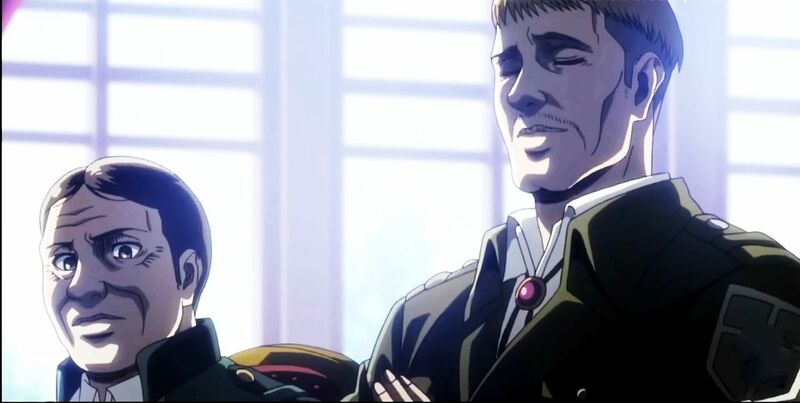 Then we get to know via Nile that Erwin is going to be publically sentenced to death. At this Erwin tells him that he had told Dot Pyxis to do a job and when Dot does his job then it’s going to be in the hands of Nile and others what steps to take further. Now, coming to the spoilers of the next episode. This episode will be titled as “Reply”. In the next episode, we’ll see Levi and others working really hard to put up a plan to rescue Erwin who’ll be sentenced to death soon. And not only that they are the ones who have to rescue Eren and Historia which does seem to be a huge and tough task. And if that’s not hard enough Levi will have to face Kenny as well. Wow, the intensity of Attack on Titan just seems to be increasing continuously and I’m just loving it. The preview sure does look interesting as hell. I hope we get to see some more action in the next episode as there wasn’t much action in the last one. So, let’s see how things unfold in the upcoming episode. There are some unofficial sites like KissAnime that allow you to watch anime. However, please support the official release by streaming the episode over Crunchyroll, or Funimation and help the anime community. Attack on Titan Season 3 Episode 5 will launch on 20 August 2018. That is it from today’s post on Attack on Titan season 3 episode 5. If you do not agree with the points in the post and have some of your own opinions, share them with us in the comments section down below. Keep visiting TheAnimeScrolls for more information about Anime, Manga and movies. Edward Kenway is the writer of “Attack on Titan Season 3 Episode 5 Spoilers, Preview, Release Date”. Connect with him on Social Media.